WASHINGTON (Oct. 08, 2008) -- During an address at the 2008 Association of the United States Army Annual Meeting and Exposition, Chief of Staff of the Army Gen. George W. Casey said the noncommissioned officer corps is what keeps the Army together. "As I travel around the Army and I look at what we've accomplished over the past seven years at war, it's clearer and clearer to me that it is our noncommissioned officer corps that is providing the glue that's not only holding this force together at a difficult time, but enabling us to accomplish the near impossible every day," he said. "And that's why next year we will celebrate their contributions to our Army." During an address at the 2008 Association of the United States Army Annual Meeting and Exposition, which runs Oct. 6-8 in Washington, D.C., Chief of Staff of the Army Gen. George W. Casey said the noncommissioned officer corps is what keeps the Army together. 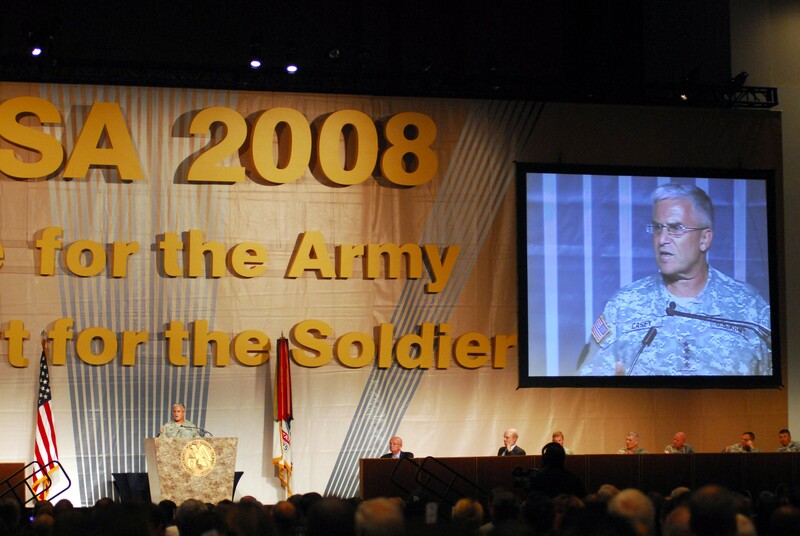 During a keynote address at the opening of the 2008 AUSA annual meeting and exposition, which runs Oct. 6-8, Secretary of the Army Pete Geren declared 2009 as "the Year of the Noncommissioned Officer." During the year, the Army will accelerate NCO development of strategic initiatives, develop new initiatives that enhance the training, education, capability, and utilization of the NCO corps, showcase the NCO story to the Army and the American people, and honor the sacrifices and celebrate contributions of the NCO corps, past and present. Gen. Casey spoke during the "Eisenhower Luncheon" at the AUSA event, to an audience of Soldiers, civilians, and foreign military members. He used the opportunity to provide an update on the status of the Army. He spoke first on the sacrifices made and honors earned by Soldiers during the seven-year conflict, saying more than 1 million Soldiers have deployed to combat and 4,700 have sacrificed their lives in service. While deployed, more than 11,000 Soldiers have earned decorations for valor, including two Medals of Honor, 14 Distinguished Service Crosses and more than 500 Silver Stars. "That our Soldiers and families so willingly sacrifice to preserve our way of life and to secure a better future for others says much about the Army's strength -- a strength that comes from our values, from our warrior ethos and from our people," he said. Casey focused the remainder of his remarks on what he said are the two most frequently asked questions of him as chief of staff: how is the Army doing, and what is the future of the Army. Last year, he said the Army was "out of balance." He took the opportunity to explain what he meant by the assessment. "The demand for our forces exceeded the sustainable supply, and we lacked sufficient strategic flexibility to respond to other contingencies as rapidly as we would like," he said. "We were unable to provide a sustainable deployment tempo for our Soldiers and families. Our support systems, designed for a pre-9/11 peacetime Army, were stretched and stressed by the demands of repeated deployments. Overall, we were consuming our readiness as fast as we were building it." The Army initiated a plan to restore that balance, Casey said. The plan was founded on four imperatives: sustaining Soldiers and families; preparing Soldiers for conflict; resetting the force upon return; and transforming the Army. Implementing the imperatives would require several years, he said. Casey said over the next three years, the Army will attempt to grow to 1.1 million people, establish a balance between deployments and time at home, substantially complete the modular reorganization and rebalancing of the force, complete the requirements spelled out under the Base Realignment and Closure Act of 2005 and fully implement the Army Force Generation model. He said the Army has already made significant progress on achieving the goals. Last year nearly 300,000 men and women enlisted or re-enlisted in the Army, Casey said. Additionally, the Army achieved a near 90-percent retention rate for Soldiers. The Army also implemented the Army Family Covenant. And to help Soldiers injured in wartime make a transition to civilian life or to new careers in the Army, some 35 "warrior transition units" were established across the force. "We set out to reduce the stigma wrongly associated with post-traumatic stress and mild traumatic brain injury," he said. "We continue to work hard at demystifying and simplifying the physical disability processes for our wounded warriors." Last year, the Army -- during wartime -- grew to 76 brigade combat teams and nearly 225 enabling brigades, Casey said. This increase in combat capability enables the Army to increase at-home time, allowing Soldiers to better prepare for war. He also said both the president and the secretary of Defense support reduction in deployments from 15 months to 12 months. A pilot reset program was initiated at 13 units last year. Under the program, active units are allowed six months and reserve-component units allowed 12 months with no readiness expectations and no Army-directed training following a deployment. "(Those) units can focus on reorganizing, education, property accountability, services and on reconnecting with their families," Casey said. At the end of the allotted time period, the Army will fill those units with the personnel and equipment they need to begin training for future missions, he said. "Given the very positive feedback so far, we plan to extend this program to 20 units in the next year, and to all resetting units by 2011," he said. For the future, Casey said he sees extended persistent conflict, dominated by warfare that is "decidedly different than the character of conflict" that has predominated his career. "I believe we should expect to deal with a range of diverse actors; frequently non-state actors, sometimes operating covertly or as proxies for states," he said. "These folks won't be bound by internationally recognized norms of behavior, and they'll be resistant to traditional means of deterrence. We should expect them to confront us asymmetrically to avoid our strengths." He said the enemies of the United States will increasingly work amongst civilian populations to both gain their support and to avoid detection -- to hide amongst civilians. "I believe the norm for us will be sustained operations in tough terrain and sprawling cities, challenging multicultural environments, and increased complexity for our leaders," he said. The future, general Casey said, will require the Army to continue to develop its capabilities. The Army should focus on developing the six characteristics he believes land forces should posses. Forces should be versatile, expeditionary, agile, lethal, sustainable and interoperable.